Doing the laundry in the 19th century was a laborious, time-consuming task. 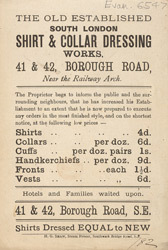 Middle class families in particular tended to engage a washer woman or laundry works, such as the one featured on this leaflet. In the laundry, the dirty clothes were soaked overnight, and the next day washed in a copper or wooden tub. Stains were tackled with the new soaps and disinfectants as well as with home-made detergents. Once washed, the laundry needed to be rinsed (usually three times), then put through a mangle, and finally hung out to dry.